There's a lot of significant differences between these two popular database applications. My goal in this article isn't to convince you that one is much better than the other. They both do a lot of similar things in different ways. It's not just a simple poker tracker vs holdem manager dilemma that will cause you to stay up nights trying to decide which will make you the best poker player in the world. In the end, a lot of it will come down to personal preference. It will depend on which aspects of a poker database application are most important to you. After reading this, you should have a much better idea of how to get your needs met so that you can focus on poker and get the most from your poker database of choice. The essential bones of each application, and how they go about storing and retrieving information is a bit different. There's pro's and con's to each approach, so I will outline both of them. Both databases use MySQL as their database storage option of choice. It's free and pretty easy to maintain. There are other options that are available, such as oracle for example, but the need for such a large storage option isn't necessary for most users, and the general cost of commercial licensing for something like Oracle would have bumped up the sales price significantly. With MySQL, both companies could reduce development and 3rd part library costs. There are some drawbacks to this since the initial development of MySQL was done before expanded file size limits, the storage limitations holds at 4 gigabytes total. There are some ways to work around that though, and this is not an issue for most users. Poker Tracker uses a query when needed approach to retrieving the data it needs to display to the user. This means each time that you want to view your stats, or review a hand from your database, Poker Tracker queries the MySQL database, retrieves the data, and then displays it for you. This is a slow and methodical approach, but it also less memory intensive since there's no real info that needs to be stored long in memory or cache. All data can be dumped once it's retrieved. It uses relatively low system resources during most of it's overall function. Thus it can be a little slow at certain times when getting large amounts of data, but overall it keeps your system resources flexible and low. Poker Tracker 4 was written in C++. The major advantage to writing in C++ is it's a stable coding environment, and it's much more portable to other platforms such as MAC OS. While Holdem Manager 2 uses MySQL also, it cache's just about all of it's user data into memory when you load the application up. Once the data is loaded, it can cycle through it's cache to pull any info you need. So in large database situations, holdem manager 2 is much faster than poker tracker 4 when retrieving data or running filters. In smaller databases of about 400 MB's or less (this is where your hand count would be ~300k-350k), you wouldn't see a major difference in benchmark time between the two databases. When you start getting over 400 MB's though, performance of Holdem manager 2 will be much quicker and more responsive. Keep in mind that if you are running large databases, you'll need a somewhat newer system with enough ram and processor power no matter which database you use. Holdem Manager 2's interface was written in WPF (windows presentation foundation). It's a very clean and sleek and somewhat newer coding language. The major drawback to it though is that you're locked into windows based platforms and there's not as much portability to other OS platforms. BOTTOM LINE: Poker Tracker has a huge edge here. It's just lighter on system resources and more reliable. You won't be getting as many crashes with Poker Tracker as you potentially would with Holdem Manager. Overall the essential framework for Poker Tracker is just much better than Holdem Manager 2. The ability to setup specific situations, and generate lots of great data and hands to review is the power of filtering. Both Holdem Manager and Poker Tracker have quite a difference process for filters. And for a lot of users this area of the program becomes a difference maker. For some, it's not even an issue because they don't want to go beyond the basics of what each tool can do. The major advantage Poker Tracker has in it's filtering is it's ability to essentially code the filter as precisely as you need with AND, OR, NOT, and grouping elements. This allows you to setup a lot of scenarios, but it takes some time to do so because everything is left open as a result possibility unless you filter the data you need in or out. What this means in a nutshell is that if you want to dig in and write some complex filters, there's a lot of flexibility to do so with Poker Tracker. It's just going to take some time to do. For example, if you wanted to create a filter where you check/called with middle pair on the flop or the turn, you'd have to create the check the flop separately. Then add middle pair, and then that you just called. You'd then have to eliminate any other made hands you might have turned like two pair, or trips. Those are not automatically eliminated from the filter. They aren't because the filtering process is left more like a very simple programming language. The advantage is you have some good flexibility, the downside is you have to really setup some long filters and check them pretty extensively to make sure your data is valid. 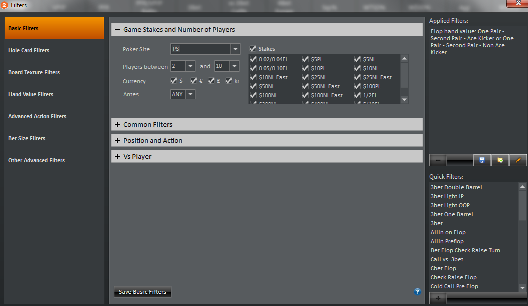 There are no preset default filters to choose from in Poker Tracker 4. There's a very small library of filters that you can download from their community and then load into your database. Otherwise you are on your own here and are left to create or find the filters you'd use most. The filtering process is a little bit easier than Poker Tracker, but not quite as much flexibility. However, there are some kinds of filters that you can easily setup in Holdem manager, that you can't even setup at all in Poker Tracker. Most of this is in the board texture area of Holdem Manager that allows for more flexibility in what kinds of textures you can filter for. Holdem Manager doesn't have a simplified programming setup for it's filtering. It tries to go for a more intuitive and easy setup for common core functions that users look to filter. It did finally add and ability to negate a filter statement by adding what are essentially NOT commands (with their true or false), but there's no ability for OR statements. 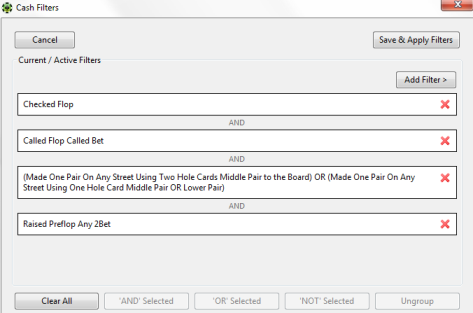 Holdem Manager offers a lot of quick filters that are pre-configured and ready to run within one click. Common things like 3-bet light OOP, Double barrel, triple barrel, squeeze, reverse float, etc... are all available in the filter sidebar and come pre-loaded with the software. There's also a community section in their forums to download other users filters, and you can import any ones that you find that you like pretty easily. BOTTOM LINE: Holdem Manager has a more intuitive filtering process that is much easier, while Poker Tracker offers a more programming savvy experience. Both can do very similar things. When building filters, we found Holdem Manager to be a bit easier, but Poker Trackers AND, OR, and NOT statements make it a little more powerful on some filters. It's somewhat of a split decision here. The look and feel of a software's interface is key to how the end user ultimately experiences the software and it's features. If this isn't intuitive and setup well, then no matter how good a piece of software is, the user may never even try to use it's key features. Overall it's a pretty simple interface. The main framework is broken up into 3 primary categories, community, play poker, and view stats. A lot of the stats view portion of the program isn't super intuitive. I'm speaking purely from a design review perspective. When you're laying out how a software interface should look, and creating mockups, you want to keep all of the main info as accessible to the user as possible, and as easy to get to. Poker Tracker made some of the data accessible, and other parts you have to do a lot of drilling (clicking) down into the application to get what you need. This can be a little confusing for some users. The data is all there more or less, but you'll have to get used to doing a good amount of clicking around to get to where you want. The main stats section of Poker Tracker is hard coded in the sense you can't configure much of it. If there's a stat like, continuation bet out of position that you'd like to see in the main stats section, you can't just add it. You have to go to another section in the stats area called "My Reports". From there you can name a report, and then add or remove stat categories that you'd like to see. But again, to get back to this data, which is what most people will want to look at if they are taking the time to create their own report, you have to do a bit of drilling to get back to it. It's not readily accessible. Holdem Manager's interface is very intuitive. It's broken up into a couple of different areas. You have a "Home" section that you can add or remove widgets that display news, free videos, poker magazines, poker tools and more. You have your reports section, which is the meat of the data tracking portion of the application. From a design perspective, everything is pretty much where it should be. Data is very accessible, and it's very easy to change stats or data to your liking. You want to add a stat like continuation bet in 3-bet pots%? No problem, just click on the stats button the sidebar and add it and boom, it's there. Holdem Manager comes with over 30 pre-set reports to view your data, and you can edit any or all of them to your liking. The active sessions tab will give you in game graphing and easy hand view / re-play. It's a simple and easy way in game to review a big hand against an opponent, or track how your session is going visually. The opponents tab will allow you to run custom reports on specific opponents. This way you can easily zero in on tough opponents, look at specific lines they've taken against you with an array of hands or situations. Setup any common scenario like called 3-bet and you can run a graphical analysis of how they've played those situations. Click on the stat analysis tab for that opponent to see area's where they are way outside of a normal range. Look at all of the hands they've played against you in the hands tab, and review any that you want to learn from. It's all very straight forward and easy to navigate. Even if you don't know too much about online poker stat analysis, the interface and setup is intuitive enough that you should be able to fumble around and figure it out. That's how a good interface should be. BOTTOM LINE: Holdem Manager has a big advantage here. It's cleaner and just all around easier to navigate. Everything is intuitively placed, and most people tend to agree that if you're a newbie to poker databases, Holdem Manager 2 is a lot easier to get around in. The essential tool of the online poker player. Having a good HUD with a layout and ease of access to the stats needed most is a huge advantage over those who don't have a HUD. The default HUDs for Poker Tracker are pretty basic. There is a Harrington inspired cash HUD that is pretty reasonable out of the box for those who don't want to mess around with creating your own HUD. With that said, there's also a ton of custom HUD setups you can purchase to get a better layout than the default setups. Overall the Poker Tracker HUD does what it's supposed to do. It gives you everything you'll need, and provides enough customizable pop-up screens to get all of the info you'll probably never need, but it looks cool to have any ways. The customization of the Poker Tracker HUD setup is pretty good. For the main default screen and the pop-up HUD stats you're provided with a drag and drop layout so you can easily move stats around and see how they look in the preview screen to your right. If you want to add a stat to a line, just click the '+' button and select add statistic. It doesn't get much easier than that. You can also easily color code stat ranges with the color ranges tab. These is especially helpful when you want to be able to scan quickly while multi tabling and know who is getting out of line or being too nitty. Overall the HUD is simple to configure and has a clean look after some simple customization. There are plenty of free HUD setups out there as well, and I'll go ahead and plug one of our own since it's pretty darn good for free. There's a few more default HUD's that are nice out of the box with Holdem Manager 2. There's 3 different Harrington HUD's, some expanded HUD's, heads up HUD's and Omaha ones that are pretty sufficient. There's also some default graphical HUD's with user graphs that are quite nice. If you didn't want to mess around too much, you could find a default HUD that would do an adequate job. Again though, there are plenty of custom HUD setups for purchase that will pimp your setup instantly, you just have to want to invest the Benjamin's to do so (yes, several are $100+). The customization of Holdem Manager's HUD is pretty decent. It's not as intuitive as it could be, or it's counter parts. Everything is just as doable, but slightly more difficult to navigate. You have to use an arrow adding system when putting new stats in place, and it can become a bit of a pain when you have a large HUD to get things situated just right. The pop-up designer can look a bit intimidating, but is actually setup pretty nice. You can drag and drop and stat you want on the grid, and with one click, edit the text of the stat label you want. 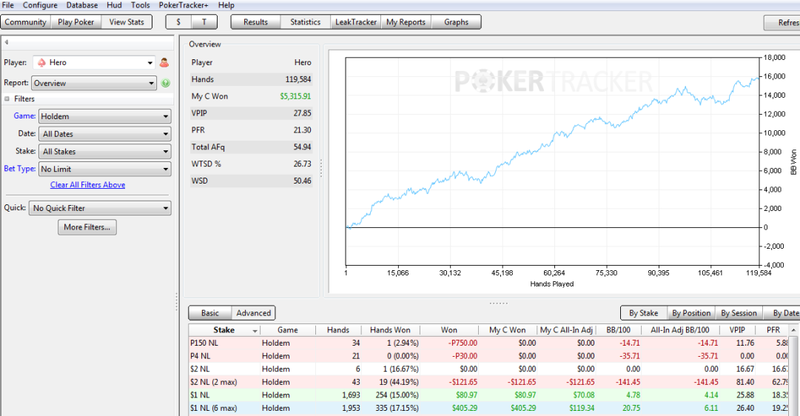 Holdem Manager separates from the pack with the chart designer and notecaddy pop-ups. These can be big difference makers if setup correctly. Overall there's more options to make a more relevant and visually appealing HUD with HM2's design setup. BOTTOM LINE: Poker Tracker 4 has a slight customization edge on this one, but Holdem Manager 2 has some great power that Poker Tracker 4 doesn't have, it you're willing to shell out some extra dough for applications like notecaddy. It's somewhat of a split decision here. Lot's of software manufactures have created third party applications for both Poker Tracker and Holdem Manager, so that your user experience could be enhanced and expanded upon. There are a few core applications that run across both database platforms. With the release of Poker Tracker 4, the Poker Tracker team decided to try and include a fairly watered down version of some of the Holdem Manager applications that Holdem Manager offered at an additional cost inside of their application. They took versions of Note Caddy, Leak Buster, and S&G Wiz, and created more basic versions of these products, and included them in their Poker Tracker 4 release for free, no additional cost. Inside of Poker Tracker 4, you have a automatic note taking application, like Note Caddy, called Note Tracker. 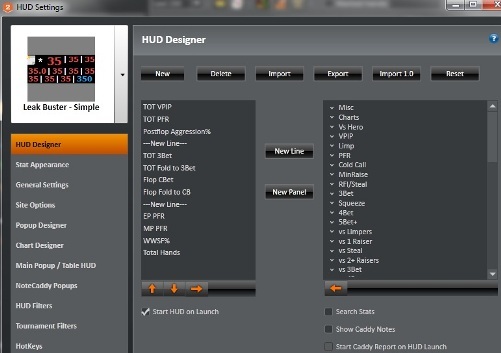 For all intents in purposes it will write some basic information in the HUD note section of Poker Tracker. You can edit and create some of your own note rules. Not too many are included, and there's a community download section to add some, but there's not very much available. It does a crude job, and does add value, but Note Caddy is much better. You'll also have Poker Tracker's version of Leak Buster, called Leak Tracker. 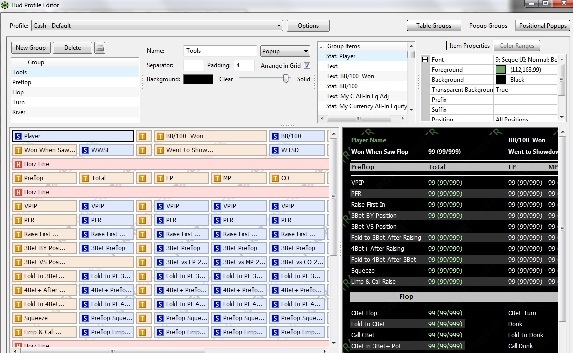 Poker Tracker essentially took two of the 10 steps from Leak Buster, and incorporated it into their software for free. Note Tracker will let you know if some of your stats are way out of line with what they'd call a solid stat range. There's not too much info on how they came up with this data though, and there's no way to understand which stat is more important that another. But as a crude concept, it can let some beginners understand some of the basic stat ranges and what they should be. It doesn't compare to Leak Buster of course, who also has training videos to go with those stats, and 8 more steps that analyze your post flop play, and not just basic stat ranges. If you go to the Tools menu in Poker Tracker 4, there's an ICM calculator and a quiz section. This essentially is a very similar format to S&G Wizard. They did a much better job copying S&G wizard into their Poker Tracker 4 release. The quizzing menu is simple and straight forward. You can setup a number of variables like how many people, how much of hero's range do you want to look at, what they payout structure is, etc... Then you can generate your own push/fold quiz and it will provide results for you based on ICM calculations. Pretty neat, and a nice add in for free. The only integrated paid application is for table tracker, which is a seat finding application. It will scan the site you wish to play at and look for tables that fit your pre-defined requirement. Meaning, in general, you're looking for the fishiest tables possible. Table tracker requires a monthly subscription. There's a lot of value added with Holdem Manager 2's embedded third party applications. They all come at an additional cost, but they are well worth it. Note Caddy has some nice additions with spark graphs in the HM2 HUD. Leak Buster comes with a free limited trial, but it never expires. Leak Buster simplifies the data review process even further, and let's you know where certain area's of your game are beginning to get out of line. S&G Wizard makes S&G training very simple and straight forward. Tilt Breaker is a great add-on for those who struggle with tilt, and will terminate and lock you out of your games based on your settings. Table Scanner makes finding fish and weak players super easy, and Table Ninja 2 makes multi-tabling a breeze. All of these are top notch applications that will add value to your game. BOTTOM LINE: You get some nice freebie versions of the popular 3rd party applications inside of Poker Tracker, but you get the real deal with Holdem Manager 2's paid applications. The bottom line, just like in life is, you get what you pay for. If you want to invest in your game, then there's not much comparison between the included 3rd party applications and the paid 3rd party apps. CONCLUSION on HM2 vs PT4: Holdem Manager 2 holds the edge on interface, and integrated 3rd party applications. Poker Tracker holds the edge in platform reliability, and free add-in products. It's somewhat of a split decision on the HUD and filtering. Both can do very similar things, and HM2 might have a slight edge if you use some of the 3rd party applications with the HUD. Try both products. Both have an extensive enough free trial that you can decide for yourself what makes the most sense for your specific game. You may love the Poker Tracker interface much more than HM2's and that might tilt the other parts of the program enough in your favor to make that your choice. Either way, they are both great products and you won't lose out with either choice. I just hope this gave you a better and more in depth look so you can make a more informed decision on your purchase.